Note: Please refer to the Model Options below when ordering. We offers Palm Key Risers as single pieces. If you would like to order a set, simply increase the quantity of your order to the desired number. The Palm Key Riser brings the palm keys 7mm (.28 in) closer to the left hand. The new ergonomic reach increases speed and ease of playing, and creates a healthier position for the muscles of the hand and wrist. Many people find the ideal combination is to use one palm key riser on the High D Key and another palm key riser on the high F key. The Skyscraper Palm Key Riser brings the palm keys 14mm (.55 in) closer to the hand, extending twice as much as the original palm key riser. The new ergonomic reach increases speed and ease of playing. Many people find the ideal combination is two skyscraper palm key risers on the high D and F keys, and one original palm key riser for the high Eb key. 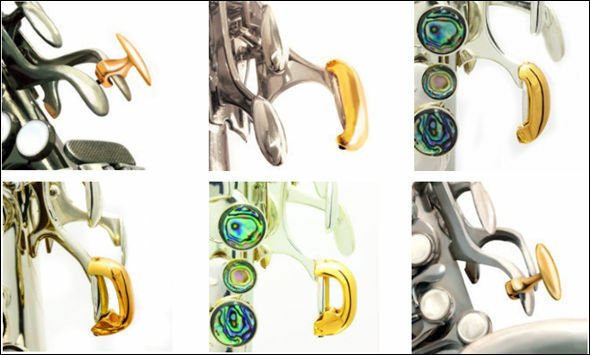 For Selmer Mark VI, SBA and prior models. Fits other contemporary brands with comparable key configurations. Also works for Yamaha sopranos.